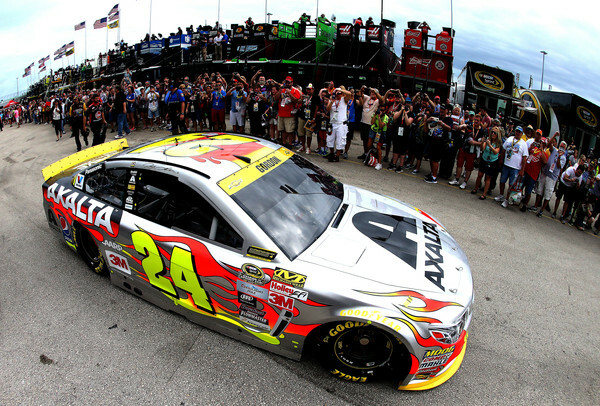 Jeff Gordon concluded his NASCAR driving career with a 6th place finish at Homestead-Miami Speedway in the Ford Ecoboost 400. 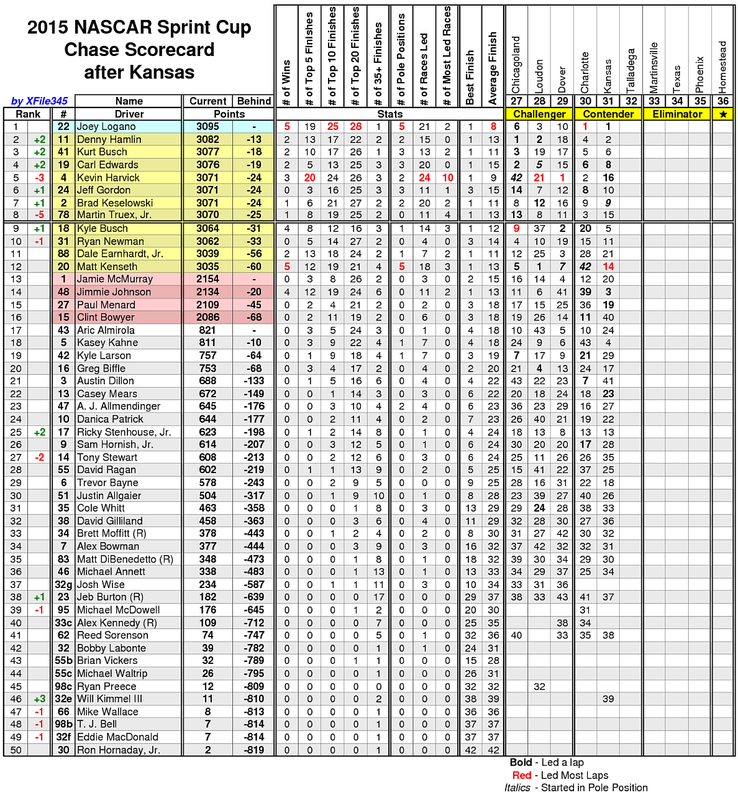 Gordon finished 3rd in the final points standings. 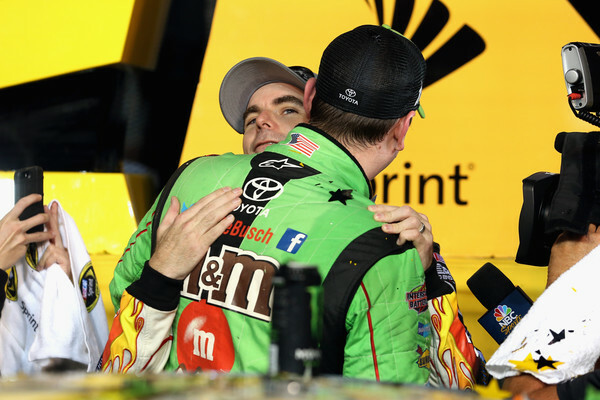 Kyle Busch won the race and claimed his first NASCAR Sprint Cup Championship by finishing a spot ahead of Kevin Harvick. 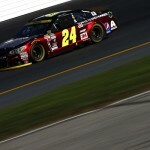 Gordon started 5th and moved to 4th by lap 2. The first caution waved on lap 13 for pole sitter Denny Hamlin’s gear problem, which forced him to pit for repairs. 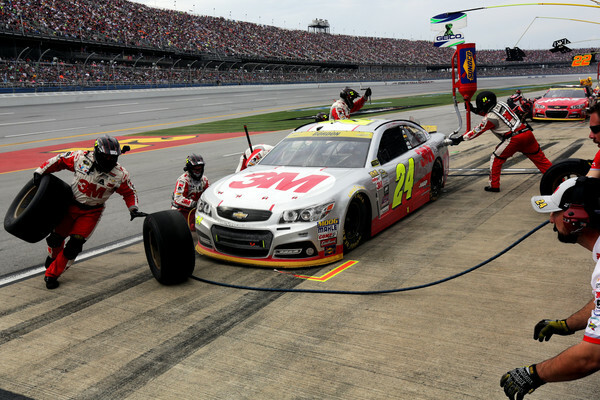 Pit stops followed with Gordon restarting in 7th place. 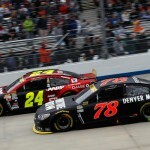 He quickly moved into the top-5, and took 4th from Martin Truex on lap 21. One lap later he moved to 3rd with a move around Joey Logano. 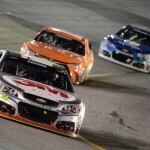 Kevin Harvick took a spot from Gordon on lap 25 to drop him to 4th. 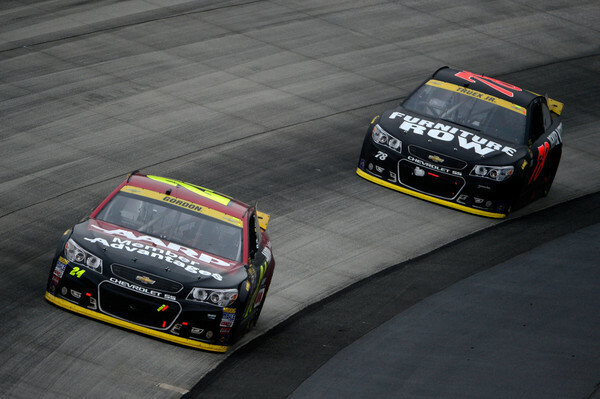 A competition caution slowed the field on lap 31. 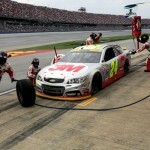 Pit stops followed with Gordon exiting in 3rd place. On the restart, Gordon dove low in turn 1 to take the race lead from Kyle Busch. A caution for Kasey Kahne’s wall contact brought out the caution on lap 42. 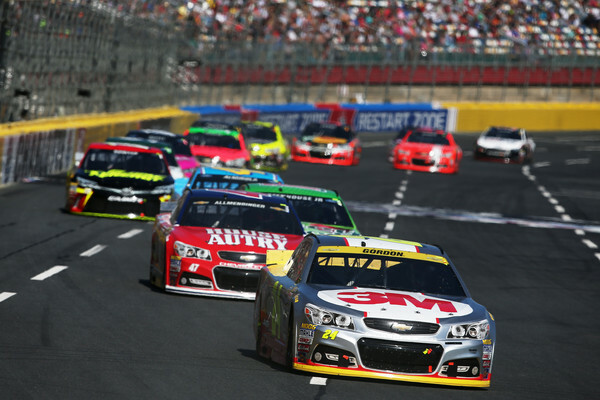 On the restart, Harvick used the outside line to his advantage to take the lead from Gordon. 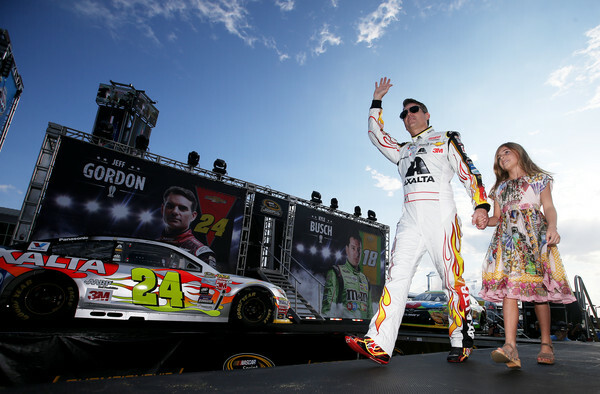 Busch took the runner-up spot from Gordon on lap 47. A caution for a wreck involving Clint Bowyer, Dale Earnhardt Jr, Aric Almirola, and Casey Mears slowed the field on lap 48. 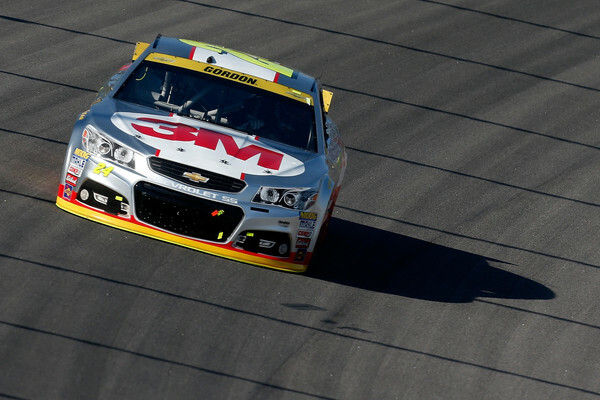 On the restart, Gordon struggled on the inside line and dropped to 8th on lap 55. 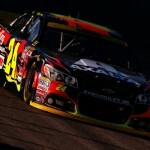 He battled handling and slipped to 12th on lap 65, before taking 11th from Jamie McMurray on lap 70. Denny Hamlin, who regrouped from earlier issues, took a spot from Gordon on lap 85. Gordon came to pit road for a green flag stop on lap 92. A spring rubber was pulled from the left rear to improve the handling. He cycled through in 13th place on lap 95. He gained one spot over the next 25 laps and ran 12th on lap 120. 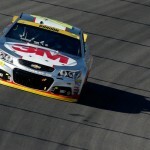 Gordon took 11th from Ryan Newman on lap 126. Gordon came to pit road for a green flag stop on lap 140 and cycled through in 12th. A debris caution slowed the field on lap 148. 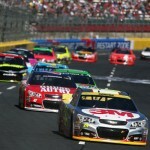 The lead laps cars pitted with Gordon restarting in 12th place. He used the outside line to his advantage and moved up to 9th on lap 156. 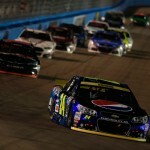 However, he dropped a spot to Jimmie Johnson on lap 159. The next caution came on lap 167 for Josh Wise’s wall contact. The leaders came to pit road with Gordon restarting 11th. He re-entered the top-10 with a pass on Ryan Blaney on lap 175. 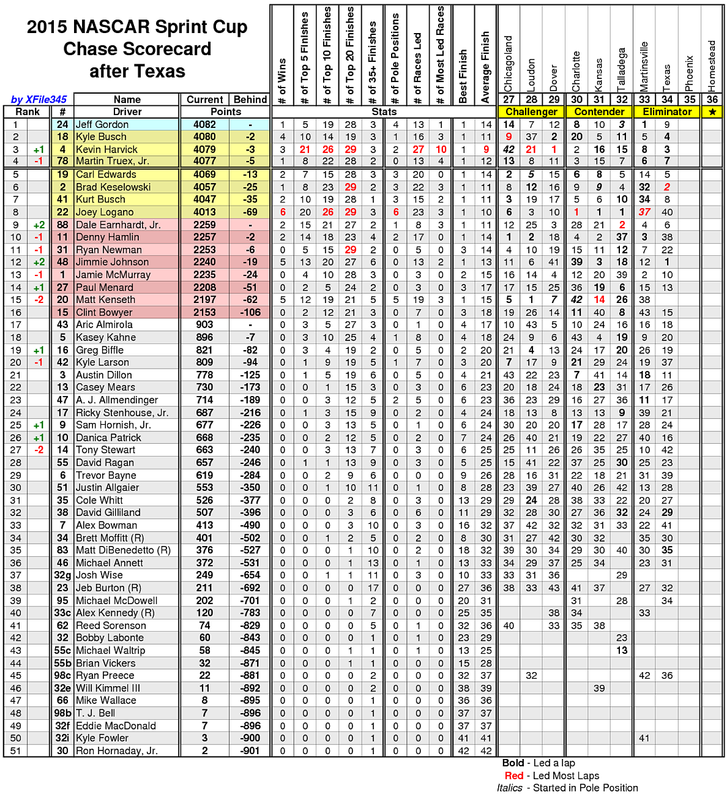 Gordon took 9th from Martin Truex on lap 186. He came to pit road for a green flag stop on lap 217 and inserted a spring rubber in the right rear. He cycled through in 11th place on lap 219. 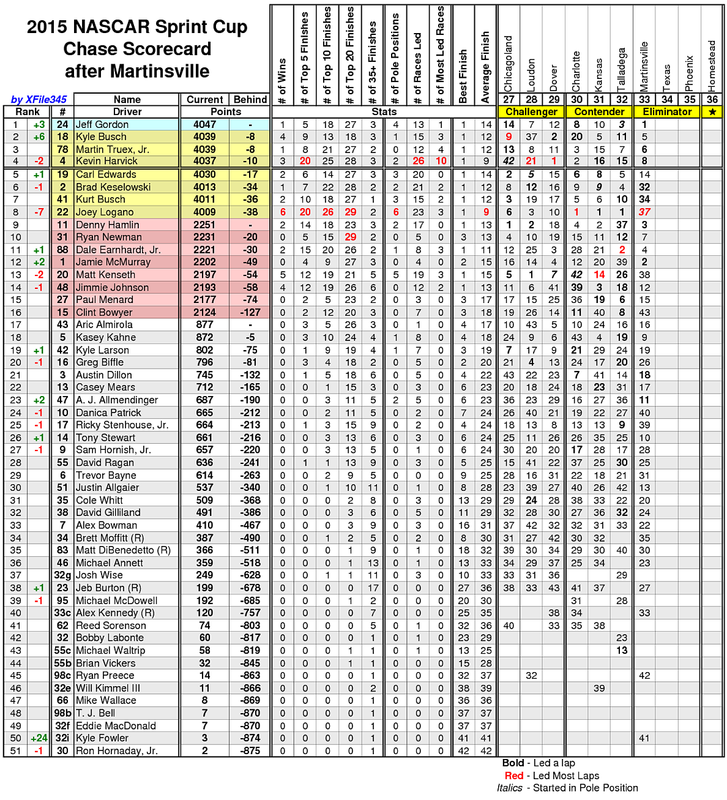 Gordon moved to 10th but ran distantly behind the leaders. A debris caution with 10 laps to go brought pit stops. 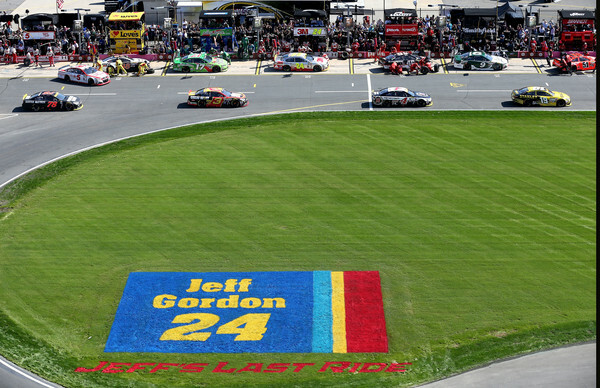 Gordon restarted in 10th place with 7 laps to go. He got a great restart on the outside line and moved to 6th place with 6 to go where he finished the race. 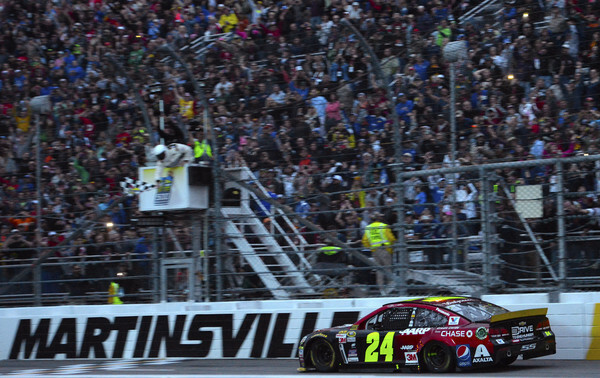 After a nearly 7-hour delay for rain, the race began under the lights. Gordon started 11th and dropped a spot in the opening laps. He gained the spot back prior to the competition caution on lap 40. After restarting in 10th, he moved to 8th by lap 60. Gordon took 7th from Kyle Larson and closed in on 6th place. He came to pit road for a green flag stop on lap 121 and cycled through in 5th place. 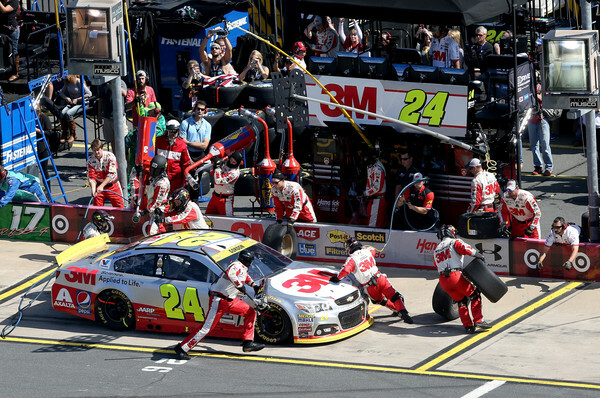 Gordon inherited the lead during a green flag pit sequence on lap 196. The caution waved for a crash involving Ricky Stenhouse and Joey Gase. Gordon came to pit road and exited in 6th place. Rain began falling once again and the red flag was displayed on lap 220. 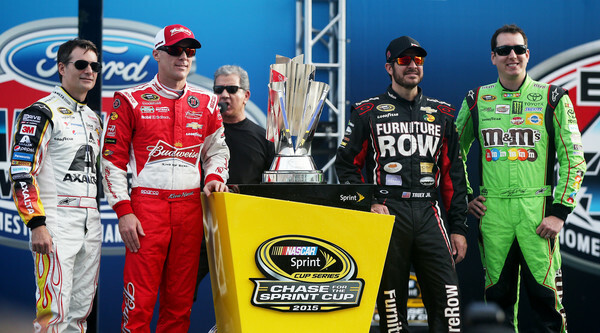 NASCAR called the race about 10 minutes later as the intensity of the rain increased. 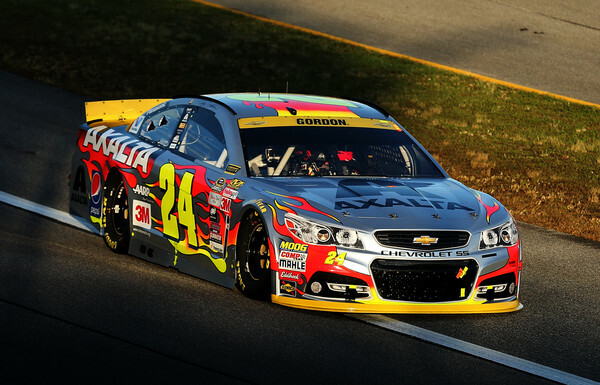 Gordon posted his 6th consecutive top-10 finish, which tied his season high. 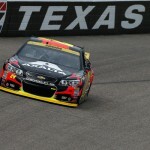 With nothing on the line at Texas Motor Speedway, Jeff Gordon drove the Axalta Chevrolet to a 9th place finish. 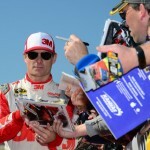 With his victory at Martinsville the previous week, Gordon is already locked into the championship race at Homestead as one of four drivers to compete for the title. Gordon started 18th and ran 14th when the first caution waved on lap 11 for Joey Logano’s cut tire. Gordon stayed on the track and moved up to 8th. He dropped a few spots and ran 10th when the competition caution slowed the field on lap 25. Pit stops followed with Gordon restarting in 10th place. The next caution came on lap 35 for Kevin Harvick’s cut tire. 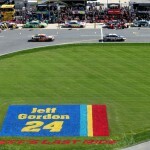 Gordon pitted and restarted in 22nd place. 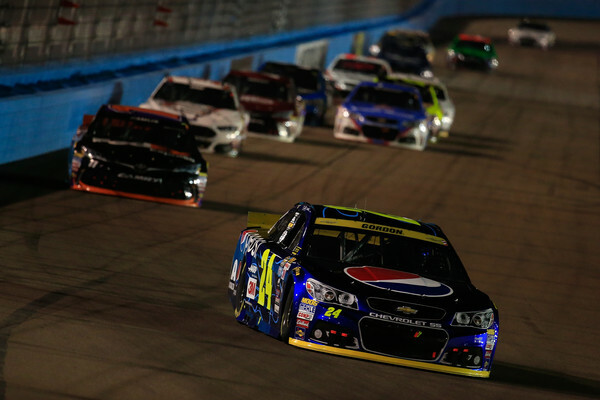 He moved up to 15th by lap 50, and ran 13th when the caution waved on lap 52 for Tony Stewart’s spin. After pit stops, Gordo restarted in 10th. He slipped to 13th before gaining 4 spots on pit road during a caution period on lap 105. At the halfway point, Gordon ran in 8th place. He ran 9th when the caution waved on lap 197 for Trevor Bayne’s cut tire. On the restart, he gained two spots to run 7th by lap 210. Gordon came to pit road for a green flag stop on lap 251. He cycled through in 8th place. Gordon advanced to 6th prior to a green flag stop with 38 laps to go. Following stops he ran in 8th place, prior to a caution with 23 laps to go. 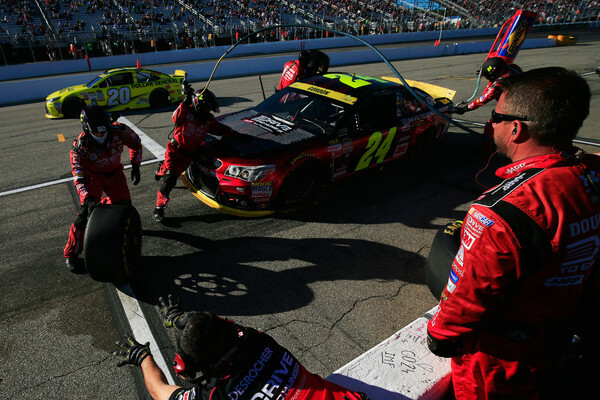 Pit stops followed with Gordon restarting in 9th with 18 to go. He briefly fell to 10th before rallying back to take 9th at the finish. 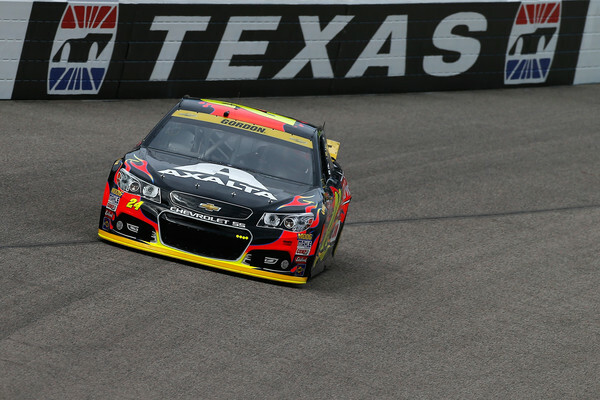 It was the first time since 2007 that Gordon posted top-10 finishes in both Texas races in the same season. 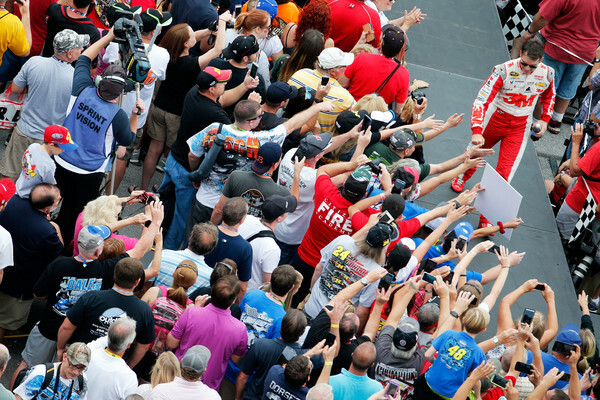 In a day that stretched into night and a race marred by mayhem, Gordon passed AJ Allmendinger with 22 laps to go to win the Goody’s 500 on the sport’s most historic track. 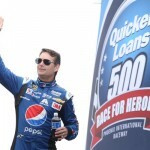 With the victory, Gordon’s very first of his final season, he is now guaranteed to be one of four racers who will compete for a championship in Homestead-Miami Speedway on Nov. 22. 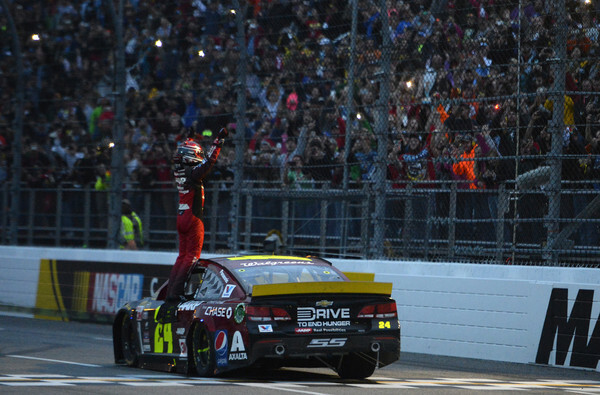 It was his 9th victory at Martinsville and 93rd of his career. 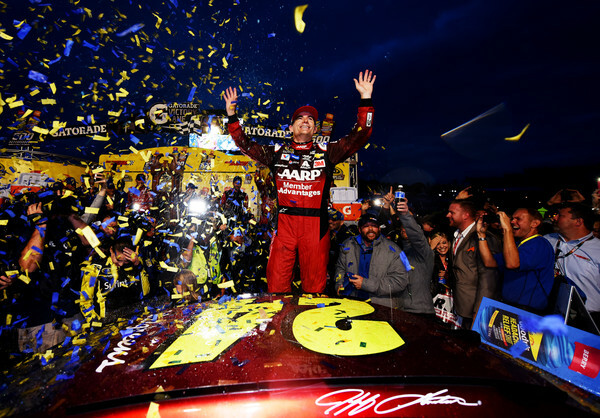 In an atmosphere Gordon described as “surreal,” he was greeted in Victory Lane by friends and rivals, loudly cheered by the thousands of race fans who stayed to watch him bask in his moment of victory. Crew chief Alan Gustafson, who has been through a lot of good and bad with Gordon, agreed with his driver’s gratitude of the fan appreciation. 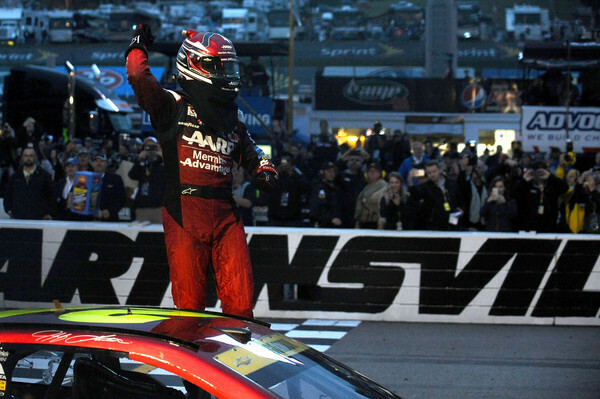 Last week, Gordon won the pole at Talladega; this week the race. Both times, it was to thunderous applause. 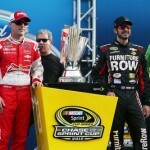 “We qualify on the pole, you can just hear the place (Talladega) erupt,” said Gustafson. “I don’t know how to describe the sensation. It’s just an amazing feeling. Then here the same way. You can hear the crowd. You don’t even have to really know what’s going on. You can hear the crowd and you can kind of figure it out. The reactions of Gordon and Gustafson are understandable. 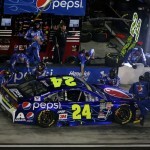 On the whole, this has been a down year for Hendrick Motorsports, the team Gordon has driven for his entire career. 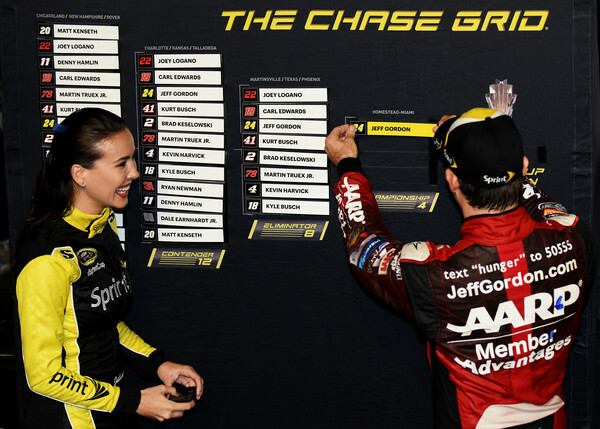 Gordon is the lone Hendrick driver still left in the Chase and the Martinsville victory was the first for the team since July Fourth weekend, when Dale Earnhardt Jr. won at Talladega. 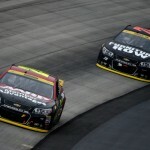 For most of the year, Gordon and Hendrick were eclipsed first by Joe Gibbs Racing, which has won 13 of 33 races, and then by Team Penske, which had Joey Logano win three in a row coming into Martinsville. The Penske duo led 350 of 500 laps on Sunday before both drivers crashed — Brad Keselowski accidentally and Logano after getting run over by Matt Kenseth. Once they were out, the race became Gordon’s to win. Afterward, Gordon was in disbelief. “It was just unreal. I mean that: unreal. I couldn’t believe that. 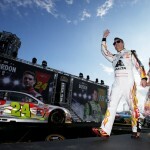 I thought this could not be happening,” Gordon said. 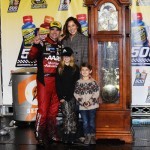 “I mean, it’s not that unusual for us to win a Martinsville race. That’s not what I’m talking about. It’s to be able to do it when so much is at stake, when you know that this is how you get to Homestead, to be one of those final four. “For us to be a team that nobody, nobody, had picked to be able to make it to Homestead, I love that we just keep proving them wrong and finding a way to move on.” That he has. 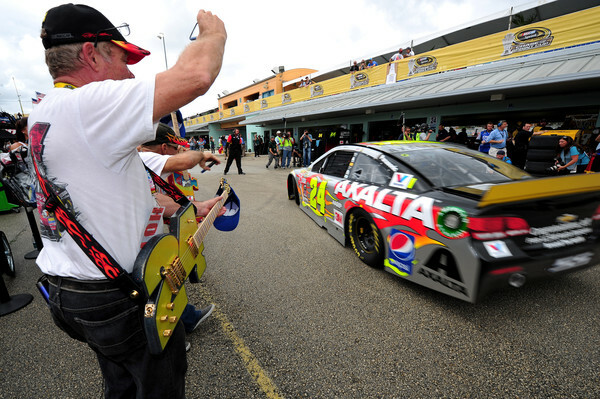 All the way to NASCAR’s biggest stage. In three weeks, we’ll see what he does when he gets there. 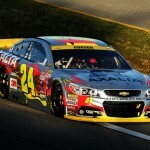 Jeff Gordon finished 3rd at Talladega to advance to Round 3 of the NASCAR Chase. 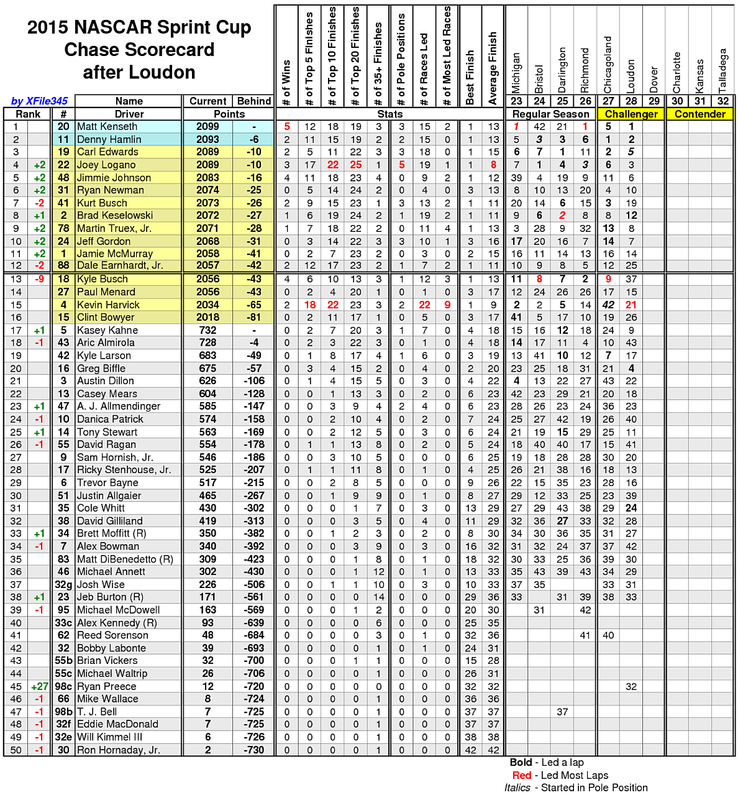 Gordon ran in the top-10 for most of the event, and tied his best finish of the 2015 season. 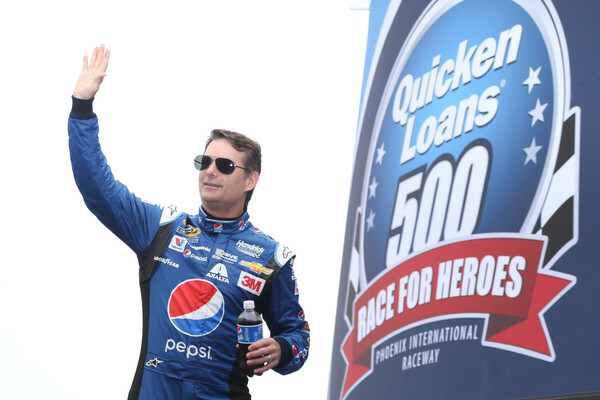 He posted top-10 finishes in all 3 races in Round 2. 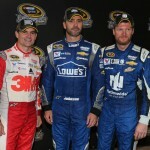 Gordon started on the pole and led the opening 8 laps before Dale Earnhardt Jr moved to the top spot. 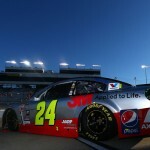 He dropped to 4th on the outside line on lap 10, before working with Joey Logano in a draft to move to 3rd. 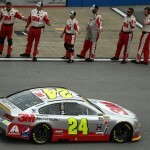 On lap 20, he moved to 2nd behind Earnhardt Jr in a single line with his Hendrick Motorsports teammates. Gordon came to pit road for a green flag pit stop on lap 41. He ran 5th on lap 44 on the outside line. Gordon ran there for the next 25 laps before being shuffled to 10th on lap 70. He elected to play it safe and dropped to 15th on lap 77, and came to pit road for a green flag stop on lap 81. 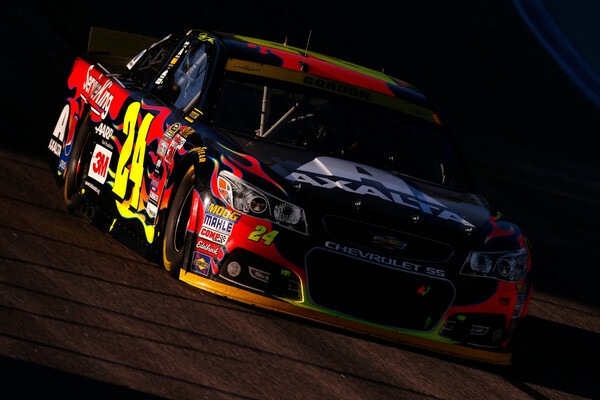 Gordon ran 8th at the halfway point. 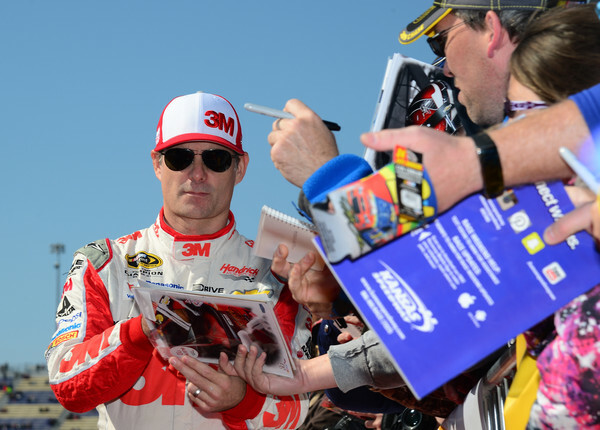 On lap 105, he drafted with Kevin Harvick into the top-5. 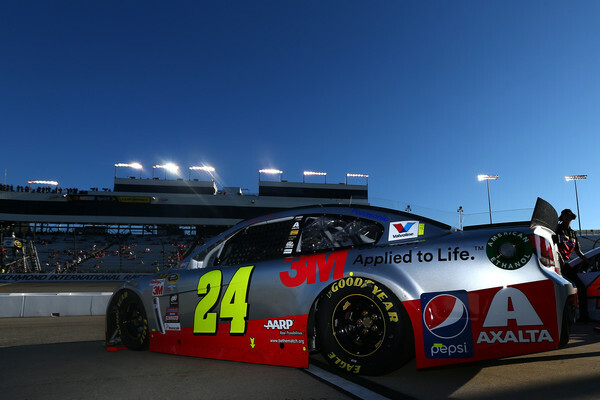 He ran 2nd on lap 120 when a cycle of green flag stops began. Gordon ran 5th on lap 125 in a single file draft. The first caution waved on lap 132 for Justin Allgaier’s engine. After a 2-tire change, Gordon restarted 4th on lap 139. With 40 to go, he ran in 10th place on the outside line. Five laps later he entered the top-5 in a draft with Jimmie Johnson. With 20 to go, Gordon ran 8th on the inside. He came to pit road for a gas only stop with 18 to go, and ran 10th in a single file line with 14 to go. 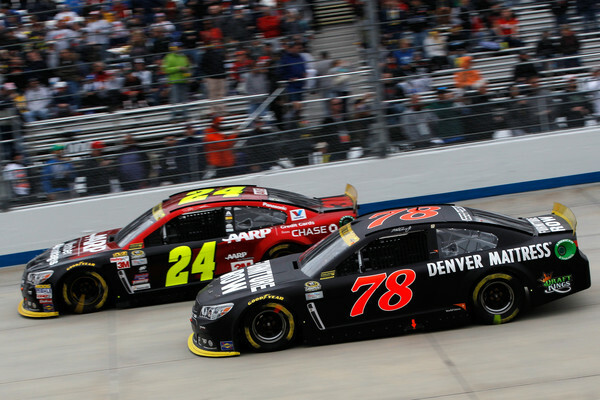 With 5 to go, he drafted up to 5th place by pushing his teammate Dale Earnhardt Jr. Jamie McMurray’s blown engine brought out the caution with 4 to go to set up a green/white/checkered finish. 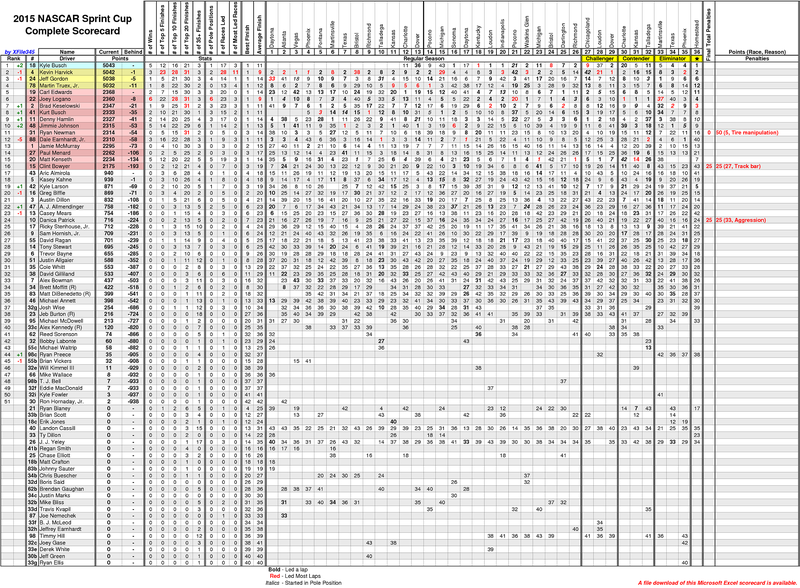 Gordon restarted 4th but the start was called off after Jimmie Johnson was spun prior to the start/finish line. 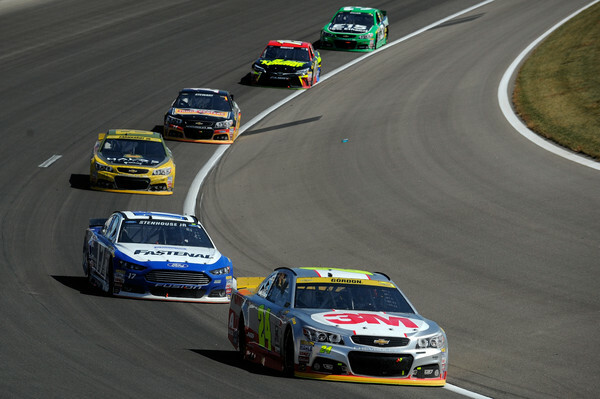 The field regrouped for a second attempt with Gordon lined up in 4th behind Joey Logano on the outside line. 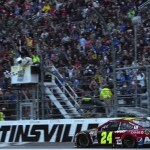 Gordon was scored 3rd as drivers began wrecking just after the green flag waved. 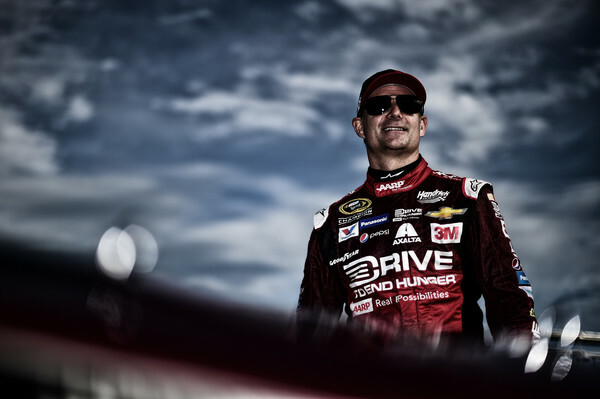 Gordon advanced to Round 3 of the NASCAR Chase. 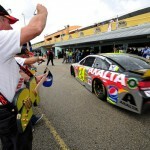 Jeff Gordon Talladega in-car audio link can be found below in the next section. 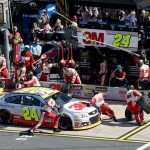 Jeff Gordon began the second round of the NASCAR Chase with an 8th place finish at Charlotte Motor Speedway. 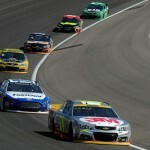 Gordon struggled at the outset with handling, but improved after the halfway point by racing his way into the top-10. He moved to 7th in the NASCAR standings, +8 over the Chase cutoff with 2 races remaining in the second round. 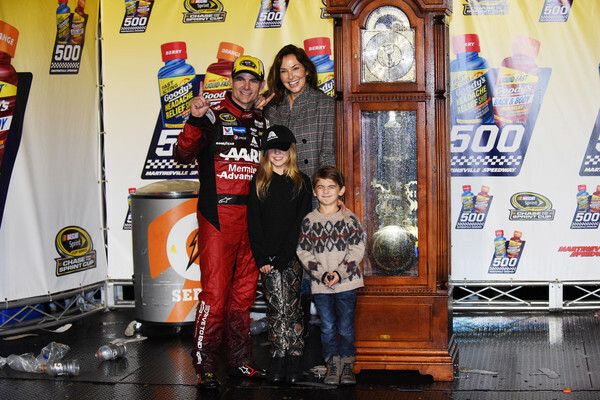 Gordon was running between 11th-15th at Charlotte before Karsyn came to watch the race on the couch. She gave me a very special bear as a gift. As I blinked away tears, Jeff gained three spots and finished 8th. I’ve probably watched 1,000 NASCAR races. This one was by far the most memorable for reasons well beyond the finishing order. 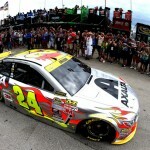 Jeff Gordon finished 12th at Dover International Speedway and advanced to the next round of the NASCAR Chase. Gordon ran in the top-10 for the balance of the day, but lost spots in the closing laps. He advanced by a mere 2 points over the final cut off line in the opening round. Gordon started 10th and dropped to 12th just before a caution for Jeb Burton’s spin on lap 3. 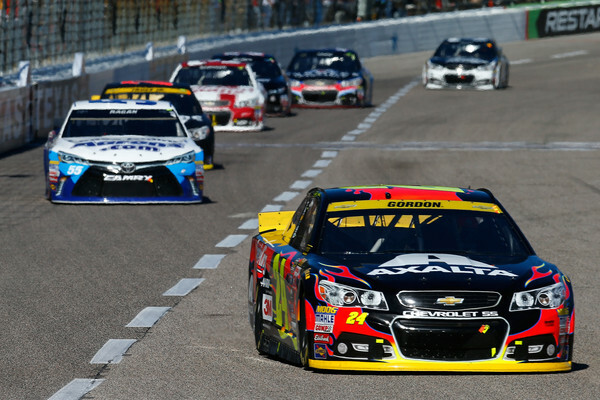 He used the outside line to his advantage on the restart to re-enter the top-10. He advanced to 9th by lap 15, but dropped a spot to Kyle Busch on lap 20. He held the 10th spot until the competition caution on lap 40. 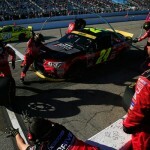 Pit stops followed with Gordon restarting in 8th place. He ran 6th on lap 50 after taking a spot from Jamie McMurray. 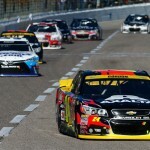 He slipped to 7th when Kurt Busch went by on lap 70, and fell to 8th when Dale Earnhardt Jr passed on lap 105. A debris caution on lap 111 brought pit stops. 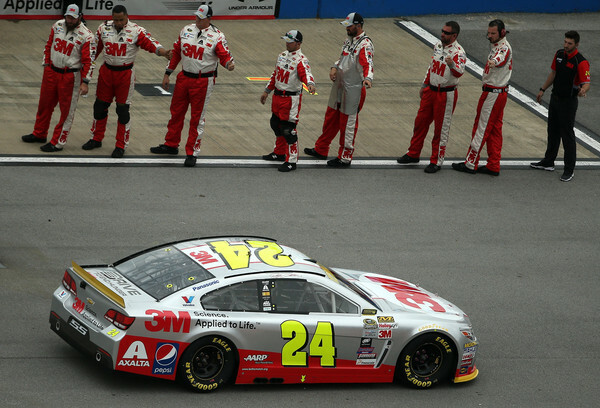 Gordon exited pit road in 12th place after a slow entry to his stall. He ran 10th when the next caution came on lap 191 for Jeb Burton’s crash. 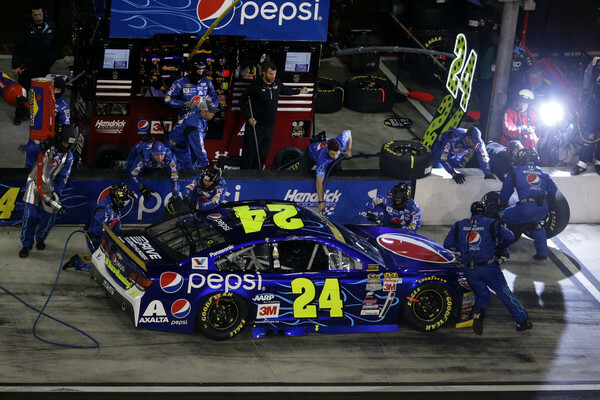 Gordon gained a spot on the restart and ran 9th when a debris caution brought pit stops on lap 232. Gordon opted for four tires and restarted in 11th. 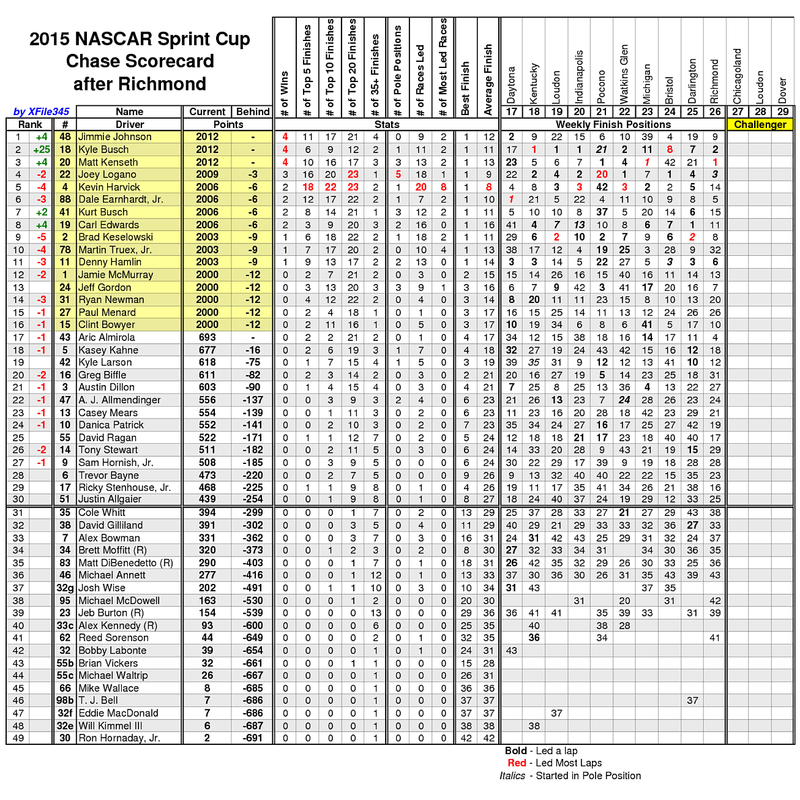 After the restart, Gordon re-entered the top-10 and eventually took 9th from Matt Kenseth on lap 283. He took 8th from Kyle Larson at the 300-lap mark. A caution for AJ Allmendinger’s spin on lap 311 brought the leaders to pit road. 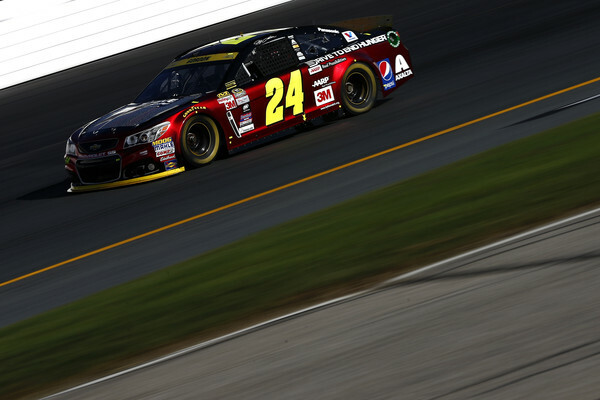 Gordon restarted in 10th place on lap 316. He advanced to 9th prior to a caution with 46 to go for Brett Moffitt’s wall contact. Gordon restarted 9th after a four-tire change. A caution for Landon Cassill’s engine with 29 to go slowed the field. Gordon stayed out and restarted 9th. He lost spots in the final laps and came across the line in 12th place. 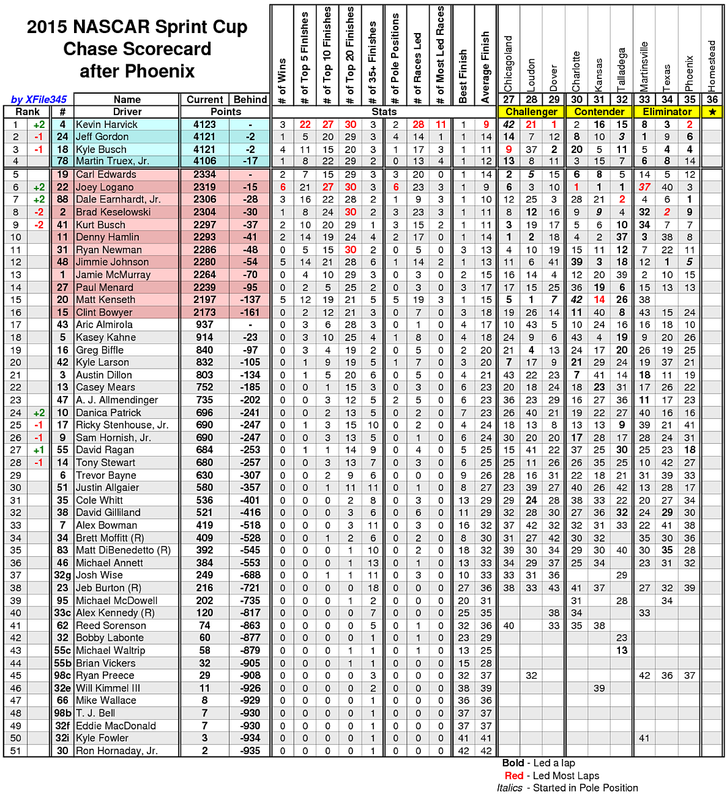 Gordon advanced to Round 2 of the Chase by a mere 2 points over the cut off line.